A Message from the Skipper: "It's down to big players to step up!" John Terry has spoken after making his 649 appearance for the club at Swansea; ahead of Liverpool tonight and has been keen to re-iterate that he needs the big players to step up as we challenge for four trophies this season. Much has been said of the squad Jose Mourinho has put together and of our title credentials. Many people would have you believe that Chelsea are right up there and considered as favourites (or at least one of the favourites) for the Champions League, FA Cup and League Cup. Now as we know, there is plenty of football to be played between now and the end of the season but the Skipper has been keen to call to the bigger players in our squad to understand what is and will be required if we are to be successful. "We've got top, top players but, as I've said before, until we go and win things, it's not there yet. That will be the test. We've shown during the first half of the season that we're capable of pushing the top sides and that's what we aim to do. There is a motivation in the dressing room to win the league and push on in the Capital One Cup, Champions League and FA Cup. At this stage, to still be involved in all competitions is where you want to be, and it's down to big players to step up." He is spot on. We cannot afford to carry anyone or have anyone suffer a dip in form that would affect the side. If we are to challenge, we need every single player ready to do exactly what the skipper has asked and give everything to the cause. What I will say is that we have a squad that is more than capable. After a "wobble" in personal form, Gary Cahill was dropped for Kurt Zouma and he came in and played really well. 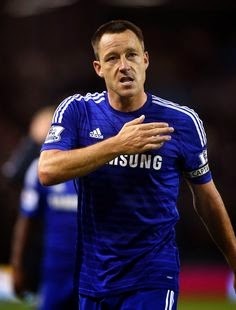 John Terry has been there, seen it and has done it for over ten years at the highest level. He knows exactly what it takes if we are to be successful this season and his call to arms comes at exactly the right time starting with Liverpool tomorrow!